Innovative incentives and increased investment from the private sector are crucial for the long-term health of the Coral Triangle region and the millions of people that depend on the marine environment for their livelihoods, says WWF. Kuala Lumpur, Malaysia – Innovative incentives and increased investment from the private sector are crucial for the long-term health of the Coral Triangle region and the millions of people that depend on the marine environment for their livelihoods, says WWF. The remarks came during the Coral Triangle Initiative Regional Business Forum 2011 in Kuala Lumpur, which closed on 11 October after 2 days of deliberations over how the private and public sectors can work together to protect the world’s most diverse marine ecosystem. “We are already seeing some encouraging sustainable and responsible initiatives take hold in Coral Triangle region, particularly in the form of public-private partnerships,” says Dr. Lida Pet-Soede Leader of the Coral Triangle Initiative. Among the several public-private partnerships recognized at the forum is a multi-stakeholder collaboration between Coop/Bell Seafood of Switzerland, Seafresh of The Netherlands, the Government of Germany, the Philippine Bureau of Fisheries and Aquatic Resources (BFAR), and WWF-Philippines on a project to improve the management of tuna handline fisheries. “While many business-backed initiatives are showing that there is a way forward, a lot more effort needs to go into assessing food security for the whole Coral Triangle. Action on this front would allow more room for investment and the creation of enabling government policies to address long-term aspects of food security throughout the region. Furthermore, it could inform development and innovation in technology to improve food security where it matters most,” added Dr. Pet-Soede. A total of six nations make up the Coral Triangle – Indonesia, Malaysia, Papua New Guinea, Philippines, Solomon Islands and Timor-Leste. A 10-year marine conservation initiative for the Coral Triangle was also announced at the forum, a move that is expected to infuse RM1.5 billion (US$475 million) into the regional economy and create 2,900 new jobs up to the year 2020. The Malaysian National News agency Bernama reported that Sabah Chief Minister, Datuk Seri Musa Aman made the announcement in the Malaysian capital on the first day of the forum. The new plan would see the creation of a Global Biodiversity Hub (GBH) in Sabah, Malaysia, which will help coordinate the sustainable development of marine resources within the Coral Triangle by working with the region’s broad community of fishermen and seeking to improve the livelihoods of farmers. Over 70 per cent of the funding for the estimated RM$896 million (US$284 million) GBH will come from the private sector. “[The Coral Triangle] is…home to over 3,000 species of reef fish and refuge for six of the world’s seven species of marine turtles,” said Minister Datuk Seri Musa Aman. “We must be mindful of the negative repercussions, including loss of income and reliable food supply, for the over 120 million people who depend on resources within the [Coral Triangle],” he added. The Chief Minister also added that estimates of the total monetary value of the region's natural marine habitats amounted to at around US$2.3 billion yearly in terms of fisheries, tourism and other related activities. Sabah is the only Malaysian state in located within the Coral Triangle. It is also part of the Sulu-Sulawesi Marine Eco-region. ♣ The Coral Triangle includes Indonesia, Malaysia, Papua New Guinea, the Philippines, the Solomon Islands, and Timor-Leste. With 5.7 million square kilometers of critical ocean and terrestrial ecosystems, the Coral Triangle supports the world’s highest concentration of marine biodiversity. It provides livelihoods for 240 million people and food security for millions more. The area is threatened by over-fishing and destructive fishing practices, land and sea-based pollution, and significant climate change impacts. ♣ The Coral Triangle is home to 76% of the world’s known coral species, 37% of the world’s coral reef fish species, and commercially-valuable species such as tuna, whales, dolphins, rays, sharks, including 6 of the world’s 7 known species of marine turtles. ♣ The Coral Triangle directly sustains the lives of more than 120 million people and contains key spawning and nursery grounds for tuna. Its reef and coastal systems also underpin a growing tourism sector. The WWF / Freund Factory Expedition is an 18-month photojournalistic journey to investigate the connectivity between the wildlife and peoples of the Coral Triangle and the threats they face. 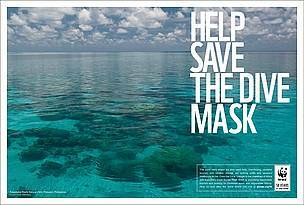 The coral reefs where we dive need help. Overfishing, careless tourism and climate change are putting reefs and people’s livelihoods at risk. 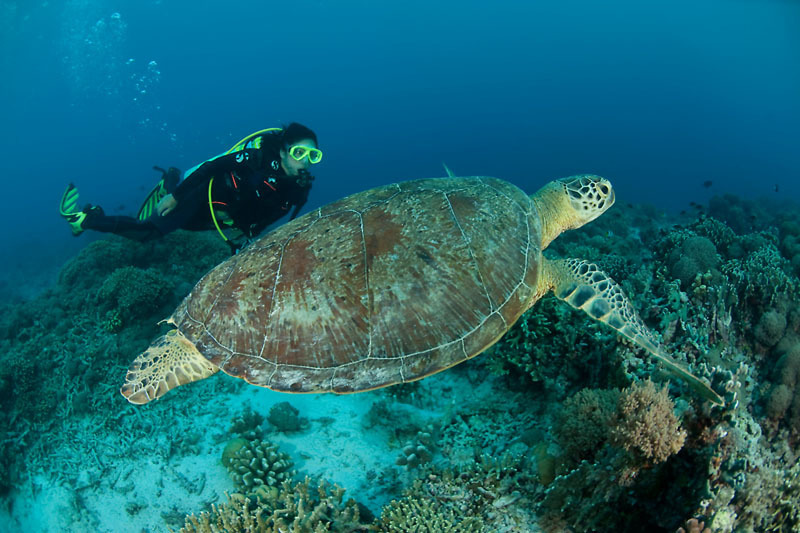 From the Coral Triangle to the coastlines of Africa and Australia’s Great Barrier Reef, WWF is promoting responsible tourism and pushing for protected areas and responsible fishing.